You may have heard the term “full dentures” or “false teeth” to describe complete dentures. 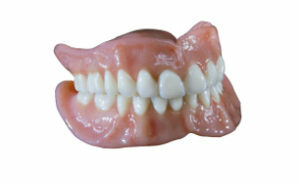 Although complete dentures are technically a set of false teeth, they are so much more. Complete dentures are made for people who are missing all their natural teeth. They are held in place by suction to ensure they don’t move while in your mouth. Furthermore, complete dentures are removable for easy care. Complete dentures are available in two types: immediate dentures and conventional dentures. What is the difference between immediate and conventional dentures? Immediate dentures are created as soon as your teeth are removed. These dentures are made for people who are having their teeth removed as opposed to people who have lost their teeth prior. Conventional dentures are made for those who have lost their teeth already and have seen proper healing in their gums and tissues. This does not mean that people who are fitted for immediate dentures are at risk because their mouth has not fully healed from tooth loss. Both denture types are safe, it’s just a matter of the state of your mouth. Conventional dentures are ready to be placed in your mouth within 8-12 weeks of teeth removal. Immediate dentures offer a temporary solution that is used until your mouth is ready for conventional dentures. Because your bones and gums shrink over time, you will need to be fitted for conventional dentures at some point in the future. However, the benefit of immediate dentures is that you will not be without teeth as soon as your natural teeth are removed. Dentures need to be cleaned as if they were natural teeth. If dentures aren’t maintained, plaque and tartar can build on them leading to stains, bad breath and gum disease. No matter how old you are it is important to maintain good oral health. If you live with or are visited by a caregiver, they will be able to maintain your dentures for you. In terms of professional cleaning and whitening, we are proud to offer those services. We will also take care of relines, repairs and adjustments as needed. Dentures look like natural teeth and allow you to get your smile back. Do not hesitate to contact us with questions about complete dentures or to set up an appointment. Remember, we bring our services to you.